Union Sportsmen’s Alliance (USA) member Lindsay Lanning was flipping through her SMART Journal when the words “Stalking Your Dream Hunt?” caught her attention. It was a page about the USA and Carhartt Ultimate Elk Hunt Sweepstakes—a trip to honor the American worker by awarding one union member and a guest with a guided, five-day elk hunt in New Mexico’s Gila National Forest, valued at approximately $22,000. “You can’t win if you don’t play,” she thought as she entered. As a member of SMART TD Local 1629, Lindsay’s job primarily consists of switching cars in the rail yard using a remote control box to control the locomotives, but she also loads and unloads an auto facility. Lindsay learned that her union benefits go well beyond the workplace when she was selected as the grand prize winner of the USA/Carhartt sweepstakes from nearly 5,000 entrants. The hunt was an amazing opportunity that got even better when Lindsay made an unexpected discovery about the outfitter. Lindsay chose to bring her father Dana Lanning of Phoenix, Arizona, on the hunt with her. Dana was a member of Operating Engineers Local 428 for more than 30 years and is currently a member of Electrical Workers Local 769. When Lindsay learned Parker would be helping on the hunt, she asked if her brother, Dalton, could tag along too. Dalton is in the Air Force and, until recently, was stationed out of the country, causing him to miss many family hunts. With the help of Parker, that was made possible for the Lanning family. During the five-day hunt, Lindsay’s father and brother took turns joining her in the field. Whoever wasn’t with her, the guide and the camera crew, glassed with Parker and the other guide on a different ridge. By luck of the draw, it was Lindsay’s brother’s turn to go with her and their guide to a blind overlooking a water hole where a nice bull had been spotted. It was the last evening of the hunt, and they were waiting as patiently as they could. The wind was in their favor as they quietly watched the water hole. And then it happened. Dalton caught sight of giant antlers coming from behind the left side of the blind. The elk made it far enough for a 45-degree angle shot to Lindsay’s left, but she couldn’t move the gun in his direction or he would see it. “Whether the elk winded us, saw us or just got nervous, he turned and bolted straight back to where he came from, completely opposite of where I was positioned,” Lindsay said. 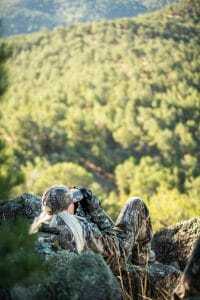 The guide jumped up and whistled in an attempt to stop the bull, while simultaneously grabbing the gun and repositioning it straight left through the blind. “Miraculously, the bull stopped, and I was able to get down in the scope and take a shot—right between the guide and the camera guy!” Lindsay said. The bull took off, but only a few seconds later, Lindsay’s brother said he heard him crash. “Had Dalton not spotted the bull out of the corner of his eye and alerted us early, we could have easily blown our cover,” Lindsay said. Lindsay had never seen her brother so excited before. Her dad and the rest of the crew arrived within 10 minutes to join in the celebrating. Aside from going home with elk meat for the freezer, Lindsay and her family were treated to free gear from several companies including Carhartt, Burris Optics, Flambeau Outdoors, Buck Knives and Thompson/Center Arms. While this may have been Lindsay’s first time hunting with a muzzleloader, it was not her first time big game hunting. She began putting in for junior elk hunts when she was around 12-years-old, and got her first cow tag at age 15. Lindsay has one cow elk to her name from a hunt seven years ago, and now she can proudly add a bull to the list. In their earliest hunting experiences, Lindsay and her brother played the role of bird dogs. Their dad would hunt dove and quail while they ran around picking up the birds and shotgun shells. Being the grand prize winner of the USA and Carhartt Ultimate Elk Hunt Sweepstakes provided the perfect opportunity for Lindsay to experience an amazing elk hunt with two of the most important people in her life.